But be careful! Your Allies can be fickle. Any cards you do not use when you create a Band must be discarded, creating opportunities for your rivals. You must also wisely choose who will be the Leader of each Band, as only Leaders can use their special abilities to aid you. 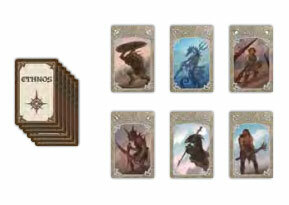 The player who can gather the most Glory over three Ages will be crowned Lord of Ethnos-and win the game! "In the Age of Creation, the land was formed, much as you know it now. In those days, heroes strode the land like gods, giving first form, and then their own names to the Six Kingdoms…"
Shuffle the Glory tokens face down, and randomly place one face up in each Glory space on the game board (three tokens per Kingdom). Then, within each Kingdom, arrange the three tokens in ascending order, with the lowest token in the "I" space and the highest in the "III" space. Each player chooses a color and takes the matching Control markers. Place one of your markers on the "0" space of the Glory Track (on the outer edge of the game board). This is your Scoring marker. Shuffle all the Setup cards and turn over six of them. These cards determine which six Tribes will be used in the game. Take the Tribe decks for those six Tribes and shuffle them together: this forms the Allies Deck. All unused Tribe decks and all of the Setup cards can be returned to the box-they will not be used this game. a. 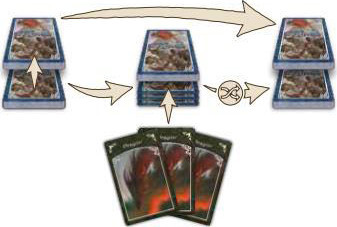 If the Merfolk are in play, place the Merfolk board next to the main game board with the side matching the number of players in the game face up. 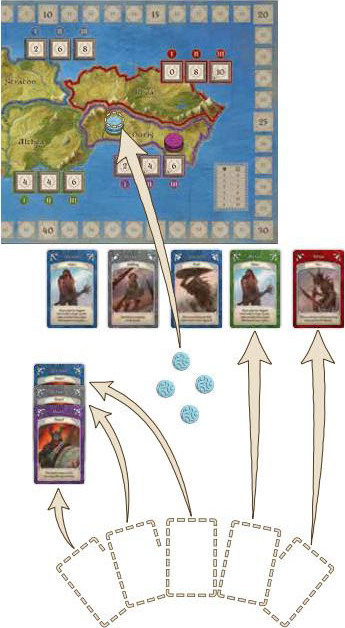 Each player places one of their Control markers on the "0" space of the Merfolk board. b. If the Trolls are in play, place all six Troll tokens next to the main game board. c. If the Giants are in play, place the Giant token next to the main game board with the side matching the number of players face up. d. If the Orcs are in play, give each player one Orc Horde board. Now you are ready for the First Age to begin! 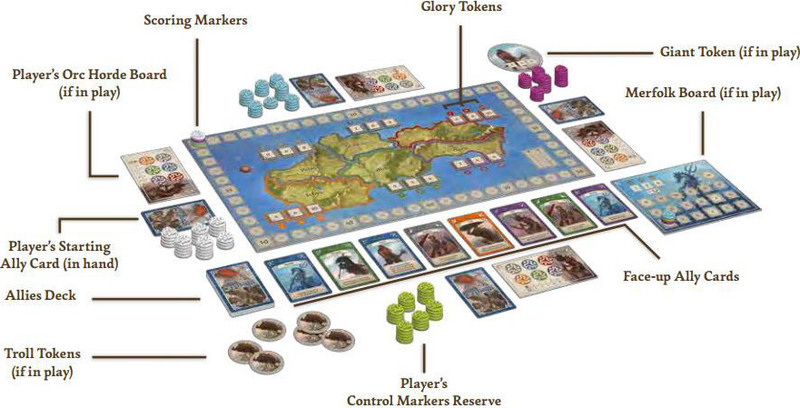 Ethnos is played over three "Ages". In each Age, you will try to collect Bands of Allies that will help you control the Kingdoms of Ethnos. At the end of each Age, you will earn Glory for the Kingdoms you control and the Bands of Allies you have gathered. Each player draws one card from the Allies Deck and adds it to their hand. 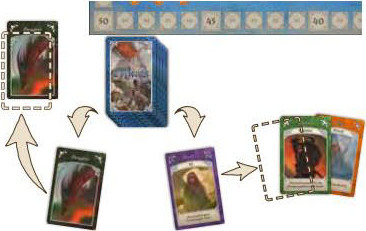 Turn over a number of cards from the Allies Deck equal to twice the number of players in the game and place them in a row face up next to the main game board (2 players = 4 cards/ 3 players = 6 cards / 4 players = 8 cards / 5 players = 10 cards/ 6 players = 12 cards). Split the rest of the Allies Deck into two roughly equal halves. Shuffle the three Dragon cards into one half, then place it underneath the other half to recreate the Allies Deck, so the Dragon cards are all in the bottom half of the deck. For the First Age, choose one player randomly to be the first player. In the Second and Third Age, the player with the least Glory (on the Glory Track) will be the first player. If there is a tie, the tied player closest to the player who drew the third Dragon card in the previous Age (starting from that player and going clockwise) is the first player. During each Age, players take turns, starting with the first player and going to the left. When you recruit an Ally, draw one card and add it to your hand. You can draw any of the face up Ally cards on the table, or you can draw the top card from the Allies Deck. If you draw one of the face up cards, do not replace it with a new one from the deck. Hand Limit: If you already have 10 Ally cards in your hand, you cannot choose this action on your turn. You must Play a Band of Allies instead. Playing Hint: In order to get the most out of your Allies, you need to collect groups that are from the same color or from the same Tribe. Example: Roderick has his eye on the Kingdom of Duris, so he needs at least one purple Ally. He already has a couple of Dwarves in his hand, so he takes the face up purple Dwarf card. Soon, Duris will be his! If you draw a Dragon card from the Allies Deck, you must reveal it immediately. Set the Dragon card beside the main game board where all players can see it. Then, draw another card from the deck. The first two Dragon cards have no effect on play, but when the third Dragon is drawn, the Age immediately comes to an end! Keep the third Dragon card next to the player who drew it, in order to help determine the next Age's First Player in case of a tie for least Glory. A Band of Allies is a group of cards that you play together from your hand. A Band can include anywhere from 1 to 10 cards. All of the cards in a Band must belong to the same Tribe (i.e., have the same name and art) or to the same Kingdom (i.e., have the same color). Lay down the cards you want to include in the Band in front of you-remember that they must all be the same color or Tribe. Choose one card in the Band to be the Leader and place it on the top of the Band. If your Band is large enough, place one of your Control markers on the Kingdom that matches the color of your Leader card. You can only place a Control marker if there are currently fewer Control markers of your color in that Kingdom than the number of cards in the Band you just played (for example, you only need 1 card to place your first marker in a Kingdom, 2 cards to place your second marker there, and so on). You may use the ability on your Leader's card (abilities on the other cards have no effect, except for the Skeleton). Each Tribe has its own unique ability. If you have any cards left in your hand after playing your Band, you must discard all of them, face up, next to the main game board. These cards will be available for any player to pick up when they choose to Recruit an Ally on their turn. Leave your Band of Allies together in front of you, with the leader card on top, so all players can see how many cards are in the Band. All the Bands of Allies you play remain there until the end of the Age. Some Tribe abilities refer to "X". This means the total number of cards in that Leader's Band of Allies. Playing Hint: Keep in mind that you can play Bands larger than what is necessary to place a Control marker, with the intention of gaining more Glory, keeping cards away from your opponents, or triggering certain Tribes' abilities. You can also play a Band smaller than necessary, without placing a Control marker, just to gain some Glory for that Band of Allies. Example 1: Roderick is ready to make his move. He plays all 3 of his Dwarf cards, making sure that the purple one is on top-that's the Leader of his new Band. Since the Leader of the Band is purple, Roderick can place a Control marker in Duris if the Band is big enough. Since he currently has 2 Control markers there, a Band of 3 Allies is big enough for him to place his third marker. Now he's in control of Duris! But will he keep it? Roderick then discards all of the cards still in his hand, placing them with the other face-up cards next to the board. Example 2: Alexis would like to add a Control marker to Duris. However, her purple Band of Allies has only 2 cards, and she already has 2 markers in Duris. She opts instead to add one of her markers to Rhea and gain the majority there. Normally, she would not be allowed to add a marker to the red Kingdom when playing a purple Leader. However, since the Leader of her Band is a Wingfolk, she can use its ability that allows the marker to be placed in any Kingdom! Alexis then discards the other cards from her hand. Players continue taking turns recruiting Allies and playing Bands until the third Dragon card is revealed. All players must discard all of the cards left in their hands. At the end of the First Age, the player with the most Control markers in a Kingdom earns Glory equal to the value on the lowest Glory token in that Kingdom (in the "I" space). Move your Scoring marker up on the Glory Track. 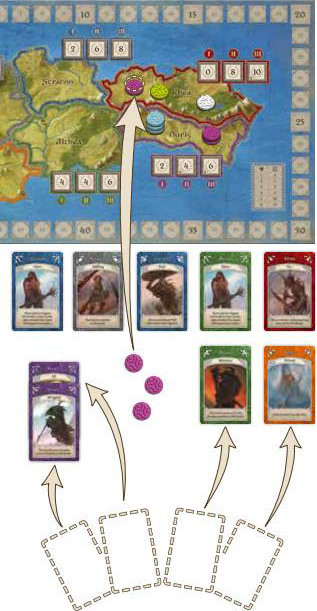 At the end of the Second Age, the player with the most Control markers in a Kingdom earns Glory equal to the value of the middle Glory token in that Kingdom (in the "II" space). The player with the second most Control markers earns Glory equal to the lowest Glory token there (in the "I" space). At the end of the Third Age, the player with the most Control markers in a Kingdom earns Glory equal to the value of the highest Glory token in that Kingdom (in the "III" space). The player with the second most earns Glory equal to the middle token (in the "II" space), and the third place player earns Glory from the lowest Glory token in that Kingdom (in the "I" space). If there is a tie for the most Control markers in a Kingdom, the Glory awards for the tied players are combined together and then divided equally between them (rounded down). Example: It's now the end of the Second Age. Despite her best efforts, Alexis has been unable to overcome Roderick's lead. He earns 4 Glory (the value of the token in the "II" space) while Alexis only earns 2 Glory (the value of the token in the "I" space). Poor Wilfred , with the third most Control markers, gets nothing. If Alexis had managed to get one more Control marker here, she would have tied with Roderick and they would have split the Glory. They would each receive 3 Glory: 4 + 2 = 6, divided by two. Wilfred would still be third and get nothing. 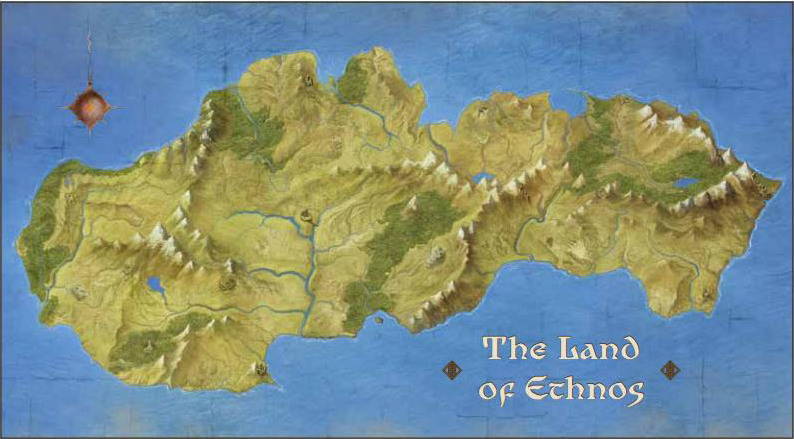 Some of the Tribes have abilities that come into play during the resolution of the End of an Age. 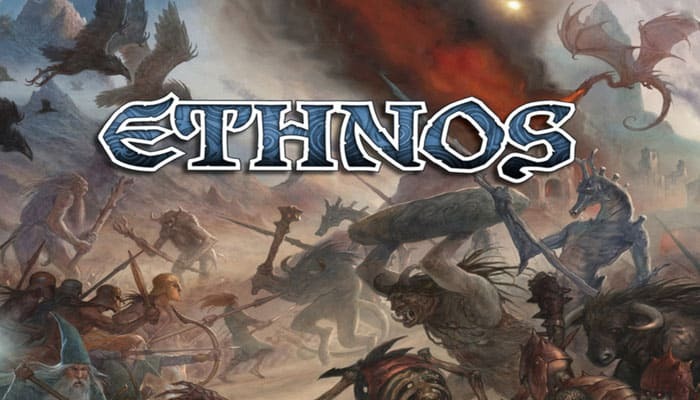 Pay special attention to the Tribes of Ethnos chapterat this point if you have the Dwarves, Giants, Merfolk, Orcs, Skeletons, or Trolls in play. Finally, every player scores Glory for each of the Bands they control. Example: Roderick has managed to play 3 Bands of Allies during the last Age. He scores 1 Glory for the Band with 2 green cards, 6 Glory for the Band with 3 Dwarves, and 6 Glory for the Band of 4 red cards: a total of 13 Glory. Once all of the players have earned their Glory, all players must discard all of their Bands of Allies. Set aside the three Dragon cards for a moment and reshuffle all of the Ally cards together again to form a new Allies Deck. Then, follow the steps for Beginning a New Age. 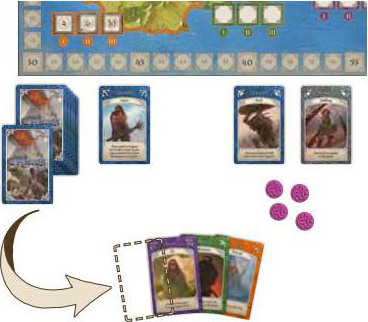 All Control markers on the main game board, the Merfolk board, and the players' Orc Horde boards, if any, remain for the next Age. All Troll and Giant tokens must be returned to the side of the main game board. If you just finished the Third and final Age, the game is over. After the Third Age is complete, the game ends, and the player who has the most Glory is the winner! In case of a tie, the winner is the tied player with the most Control markers on the board. If a tie persists, victory goes to the largest Band of Allies played in the last Age, then second largest, and so on. Before mixing the Glory tokens, remove the tokens marked with a "4+" and return them to the box. Then, shuffle the rest of the tokens and place two in each Kingdom. Turn over only five of the Setup cards (instead of six). There will only be five Tribes in the game. 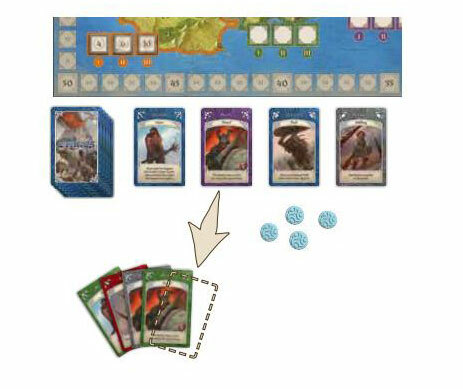 If the Tribe of Merfolk or the Tribe of Giants are in the game, use the 2-3 player side of the matching board or token. At the end of the First Age, the player with the most Control markers in each Kingdom earns Glory equal to the lowest Glory token in that Kingdom, as normal. At the end of the Second Age, the player with the most Control markers in a Kingdom earns Glory equal to the highest token there. Unlike the normal game, the player with the second-most Control markers does not earn any Glory for that Kingdom. However, if only one player has Control markers in a Kingdom at the end of the Second Age, that player earns Glory equal to the value of both Glory tokens in that Kingdom! You'll have to consider spending resources in every Kingdom, even if there is no chance of winning control there! In a 3-player game, the Kingdoms are scored normally at the end of both Ages. In order to place your Control marker in a Kingdom, you need to play a Band with more cards than the total number of Control markers in the Kingdom. Example: if there are 2 of your markers, and 1 of your opponent, to add a marker you need to play a Band with at least 4 cards.